Alice TodHunter Moon, Apprentice to the ExtraOrdinary Wizard Septimus Heap, will need both her Magykal and PathFinding abilities to retrieve a lost Orm Egg from the evil sorcerer Oraton-Marr before it hatches. The Orm Egg timer is counting down the hours until the hatching. But other than a vague idea that the Egg must be somewhere warm, the Wizards are at a loss for where to find it. 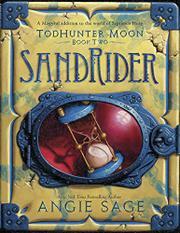 When a young girl stumbles onto one of the Ancient Ways and bursts right into their midst, Tod is the first to recognize that she might hold the information they are all seeking. But the Egg is only one of Tod’s concerns. Being the ExtraOrdinary Apprentice carries a great deal of responsibility and expectations. Somehow she needs to find the Egg, win the Apprentice Race, escape from the Wendron Witches, and defeat Oraton-Marr—all while keeping her friends safe. This second installment in the TodHunter Moon trilogy is packed with quirky details, rich settings, and lovable characters. The fast-paced plot filled with surprising twists, dangerous foes, and one wily dragon will enthrall longtime fans. However, the large cast of characters and intricate worldbuilding require that readers start at the beginning of the series or risk losing the path.